You could be the Omen prophesized: the greatest warlord the isles have ever seen. Your thirst for power is matched only by your strategic wit and cunning. You know no rival... aside from your brother. As sons of Zeus, you stand poised to conquer all of Greece, but not without the blessing of the gods. To determine who shall rule the domain of man, the gods have devised a contest and lent their most powerful forces for the cause: pillage and raze three cities. When the reign of war ends, only one brother will be victorious, while the other will fade into antiquity as just another half-god spawn of Zeus. 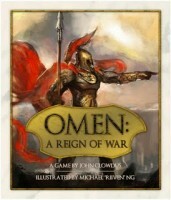 Omen: A Reign of War offers strategic card play for 2 players. The game is ready to play right out of the box, but also offers deck building rules for additional gameplay options. As gamers, we have a need to categorize games, saying, “this is a miniatures game,” or “that’s a co-op game, ” or this one has worker placement or deck-building, etc. With Omen: A Reign of War, John Clowdus has developed a card game that seems to defy typical classification. One of the most striking things about the game is the artwork. Small Box Games has done an amazing job with the illustrations on each card. Michael “Riiven” Ng’s work really helps to pull players into the dark atmosphere of the game. Although the pictures may not be appreciated by some, I feel the artwork alone is worth the price of the game. The object of the game is to earn victory points. This is done in two ways: by accomplishing various feats, which are achieved by playing specific patterns or types of cards or forcing your opponent to discard certain numbers of cards, and by earning rewards, which come from winning wars in the the five cities. The game is made up of turns that are divided into multiples steps. In each turn, the players have the opportunity to gain coins or draw cards, play units into cities, take advantage of special abilities from any active “oracles” present in the cities, resolve any “war-torn” cities and potentially earn rewards, and then make offerings to convert cards from their hand into additional cards or coins. What makes the game great is the variety of difficult decisions you are forced to make from the very start of each turn. In your “wealth” step, you can choose some combination of three coins or cards, but if you decide to choose only one type, you get a bonus resource. Do you choose to pick cards and coins, or do you sacrifice earning coins to get an extra card? The decision may come back to haunt you when you don’t have enough coins to put the extra cards into play. The beast units can be played into the cities to provide strength in a war, or they can be discarded to utilize their special abilities. The reward cards gained from winning in cities can be used for special advantages on a turn, but then they are worth less victory points at the end of the game. In playing the game, you continuously make difficult and fun decisions that can have significant effects on the outcome of the game. To me, a telling point about the quality of gameplay is that my wife, who is definitely not a gamer, will ask, ” do you want to play that card game tonight?” It is visually impressive, competitive and tense with lots of complex decisions, and can be played in less than an hour without feeling like a “filler” game. And it comes in an extremely creative package (an old VHS tape box). I highly recommend this game to anyone looking for a fun, engaging challenge. Add a Review for "Omen: A Reign of War"